The very name Black Forest conjures up images of deep woodlands, traditional deep-roofed farmhouses, cuckoo clocks, and half-timbered villages that look as though they'd stepped out of a book of fairy tales. And, of course the famous Black Forest cherry cake. And you'll find all of these in the rolling landscapes of Baden-Württemberg in Germany's southwestern corner. The heart of the Black Forest extends southward from Pfortzheim and Baden-Baden, roughly paralleling the Rhine Valley to the lakes near the Swiss border, and its rural farmland, forests, and picturesque villages are connected by roads that climb and curve through a never-ending series of photo-worthy views. Amid these appealing landscapes, you'll find lots to see and do in the Black Forest. The region itself, with its traditions and unique way of life, is a major tourist attraction. The area most popular with tourists, and where you'll find some of the most beautiful places to visit in the Black Forest, is the stretch along the 150-kilometer-long Black Forest Railway (Schwarzwaldbahn), and Triberg with its famous waterfalls. The southern Black Forest is dominated by the 1,493-meter-high Feldberg, and to the south are the lakes of Titisee and Schulsee, popular family holiday areas with swimming and water sports. Plan your trip to this beautiful region with our list of the top attractions and places to visit in the Black Forest. To find some of the best places to visit in the Black Forest, you should explore its countryside by car, following one of the several designated tourism routes. The most popular of these is the Black Forest Ridgeway (Schwarzwald-Hochstrasse), a spectacular route following hill crests through magnificent coniferous forests from Baden-Baden along the Hornisgrinde to the Kniebis plateau at Freudenstadt. The route continues southward from Triberg to Waldshut. The Black Forest Valley Road (Schwarzwald-Tälerstrasse) begins farther north at Rastatt, home to the sumptuous Schloss Favorite, a former summer residence and pleasure palace for Margravine Sibylla Augusta of Baden-Baden, with the largest collection of early Meissen porcelain in the world. The road follows the Murg valley, past the imposing Schwarzenbach Dam and continuing to Freudenstadt, where it meets the Black Forest Ridgeway. Spa-goers should follow the Black Forest Spa Route (Schwarzwald-Bäderstrasse), a 270-kilometer-long loop of spas, including Baden-Baden, between Pforzheim and Freudenstadt. One of the great masterpieces of Gothic architecture in Germany, Freiburg im Breisgau Münster was built between the 13th and 16th centuries and is known for its beautiful interior and artworks. Highlights are the 14th-century stained glass in the aisles and the early 16th-century altarpieces, the one in the University Chapel by Hans Holbein the Younger. The stiff climb up the 116-meter-high tower, built in 1330, is rewarded with sweeping views across the rooftops of the old town center. Surrounding Münsterplatz, well-preserved old buildings include the arcaded red Merchants' Hall (Kaufhaus) dating from 1532, with stepped gables and oriel windows. Other highlights of the old town include the old Martinstor (St. Martin's Gate); the 13th-century Schwabentor, with its wall paintings and dioramas; the Late Gothic House of the Whale (Haus zum Walfisch); and the Gothic St. Martin's Church, with a beautifully restored interior and cloister. For a bird's-eye view of the Munster and old town, ride the Schlossbergbahn funicular railway to the 456-meter Schlossberg to look down from the Kanonenplatz. The mineral spas that have made Baden-Baden a popular place to visit since Roman times are the focal point of this beautiful old city at the edge of the Rhine Valley. The elegant 19th-century Friedrichsbad and the modern Caracalla Baths sit side by side, and from the beautifully groomed Kurpark (Spa Gardens) the lovely Lichtentaler Allee follows the Oos river for more than two kilometers of arboretum and gardens. The highlight is a rose garden with 400 different varieties, along with pools, fountains, and an Art Nouveau pavilion. Baden-Baden is at the start of the Schwarzwald-Hochstrasse tourist route. Badenweiler, another spa town farther south in the Black Forest, is not as well known, but is also very beautiful, sitting on a terrace more than 200 meters above the Rhine. Its Kurpark is filled with subtropical plants, and the 11th-century Schlossberg castle ruins command views across the Rhine valley. A walking path climbs through the steep Triberg forest, stopping at seven different viewpoints overlooking the river as it plunges down 163 meters from pool to pool in a constant white froth. The succession of cascades and waterfalls creates an ever-changing set of views as you climb, and it's worth going all the way to the wooden bridge at the top for the views down into the rocky ravine. The falls are lighted at night, accessible all year, and are a spectacular cascade of ice in the depth of winter. Another of the interesting places to visit in Triberg is the Black Forest Museum (Schwarzwaldmuseum), with displays focusing on the region's unique traditions and handcrafts. Without doubt one of the prettiest towns in the Black Forest, Schiltach has been the home of craftsmen and tanners since at least the 13th century. Surrounded by woodlands and located at the junction of three rivers, it was a natural to become the Black Forest's center for timber rafting. The riverside location was well-suited to tanning hides, and the oldest part of Schiltach, outside the town walls, is made up of closely set timber-framed houses of tanners. The sloping triangular Marktplatz is surrounded by more half-timbered houses, and it's here that you'll find two of the town's free museums, Museum am Markt and the Apothecary Museum. The Schüttesäge Museum centers on the work at the former sawmill, in operation from 1491 until 1931, with an undershot water wheel more than seven meters in diameter. But the biggest attraction for tourists is the town itself, so be sure to spend some time here on a walking tour. As you travel through the region, you are sure to see a number of the typical multi-storied farmhouses, with their giant sloping roofs and overhanging eves. To learn more about these, as well as to tour one from its ground-floor barn to its rows of food drying under the attic rafters, stop at the Black Forest Open Air Museum. The focal point of the Schwarzwälder Freilichtmuseum is the Vogtsbauernhof, a traditional self-contained farmstead dating from the 1600s. The farmhouse and its cottages and outbuildings were brought here from their original sites, and together form a typical Black Forest farming hamlet. Here, you can get a close-up view of farming and building techniques, such as thatching a roof and making cheese, as well as home skills such as weaving and wood-fire cooking. Many of the hands-on programs are suitable for children, and free guided tours in the summer are in English. The on-site café serves traditional Black Forest specialties. At the northern edge of the Black Forest in the little town of Maulbronn, stands the Cistercian abbey of Kloster Maulbronn, which was founded in 1147. Its stone and half-timbered buildings comprise one of the most beautiful and best preserved of the surviving German monasteries, and Kloster Maulbronn has been named a UNESCO World Heritage Site. The most outstanding of its many highlights is the porch of the church, known as the Paradise, a masterpiece of the early Gothic style, with cross-ribbed vaults; the beautiful pine and wrought-iron doors are the oldest known in Germany. Be sure to also see the delicate fountain house, with its three-tiered fountain, and the richly carved stalls in the monks' choir. The town of Gengenbach sits at the western edge of the Black Forest, its charming Altstadt of stone towers and half-timbered houses gathered around a market square. Forming one side of the square is the 200-year-old façade of the town hall, which is best known for it important role in Gengenbach's Christmas Market. For 24 days in December, the town hall becomes a giant Advent calendar, with each of its 24 large windows opening in turn to reveal an elaborate scene. Beyond the usual Christmas motifs, these are based on annual themes often suggested by works of great artists or by literature. At 6pm each afternoon, it seems as though the entire town population is in the square to see the window revealed. You may notice whimsical statues throughout the town, portraying jesters and fanciful figures; you can learn more about these at the Fools Museum Niggelturm, located in a historic tower. Here, you'll see Fasnacht figures, masks, and costumes used during the pre-Lenten carnival celebrations. These Fasnacht hijinks are traditional in other parts of Germany as well but are particularly strong in this region and reach their highlight here. Climb to the top floor of the 136-meter tower for views of the town and surrounding fruit orchards. The highest lake in the Black Forest, Titisee is one of the most popular places for families, with a wide range of entertainment possibilities. Its shores are a pleasant mix of forests and lodgings, so while there are plenty of places to stay, the lake retains its natural landscape. The Seestraße in Titisee-Neustadt is a promenade, where you can stroll between the shore and a selection of shops and cafes (a good place to stop and sample Black Forest cherry cake). Or take a 90-minute hike on the trail around the lake. You can bike along the Bähnle-Radweg path or rent nearly any kind of small boat from motorboats to kayaks, stand up paddleboards, and pedal boats. The lake is a bit chilly for most swimmers, but the Badeparadies Schwarzwald is a water park with themed saunas, a spa, waterslides, and 18 pools surrounded by live palm trees. Housed in the former monastery of Augustinian Hermits, the Augustinermuseum is a bright and lively place filled with artistic and historical treasures of the Black Forest and Upper Rhine regions. No dim showcases here; the building was brilliantly adapted by architect Christoph Mäckler, so the collections are displayed in well-lighted galleries that encourage viewing from different angles. Specialties are works from the Middle Ages through the Baroque period, along with 19th-century paintings. Medieval wood sculptures, panel paintings, and original stone figures and stained glass windows from the Munster are highlights. The nine scenic hamlets that make up the little town of Baiersbronn have gained fame in culinary circles for the remarkable number of Michelin stars awarded to three local restaurants. These three restaurants account for a total of eight stars: three to the Schwarzwaldstube in Hotel Traube Tonbach, three to the Restaurant Bareiss, and two to the Restaurant Schlossberg. Between meals in these bastions of fine dining, tourists will find other attractions and things to do. The atmospheric ruins of the Kloster Allerheiligen, the Monastery of All Saints, are made even more haunting by their secluded setting and unfortunate history. Since its founding in 1192, the monastery has been destroyed repeatedly by fires — in 1470, in 1555, and finally by lightning in 1804. Southwest of Baiersbronn a wooded path leads to the 60-meter Sankenbach Waterfalls. Also known as Devil's Valley, the nine-kilometer stretch of road between Freiburg and Hinterzarten descends precipitously into a narrow gorge surrounded by thickly forested and very steep hillsides. The scene is rendered all the more foreboding by the soaring stone arches of a viaduct that hovers 190 feet overhead, carrying the Devil's Valley Railway. At the bottom of the winding road is the welcoming sight of the Hofgut Sternen, a historic hotel whose former guests included Marie Antoinette as she traveled through here on her way to become Queen of France. In the complex of traditional Black Forest buildings surrounding the inn are a glassblowing studio and a cuckoo clock shop; you can watch craftsmen working in both of these. A path leads farther down the valley to the historic St. Oswald's Chapel, the area's first church, built in 1148. For four weekends in December, the steep hillside beneath the stone arches of the viaduct is the site of the Ravenna Gorge Christmas Market, one of the hidden gems of the Black Forest. The exact source of the Danube River still gives rise to controversy, although it has been "officially" decided by the government of the state of Baden-Württemberg that only the Donabauch spring in Donaueschingen, where the Brigach River begins, can claim to be the source. Previously, the town of Furtwangen claimed it, based on the fact that the Breg, the larger of the two streams that join to form the Danube, begins there at the Bregtal spring. You can visit the Donabauch spring, suitably enshrined in elaborate iron grill and stonework in the Schlosspark in Donaueschingen, on the eastern fringe of the Black Forest. Schloss Donaueschingen features sumptuous state apartments full of tapestries and period furniture, a Court Library of medieval manuscripts, and a collection of works by 15th- and 16th-century Swabian painters. The most enduring — and endearing — example of Black Forest folk art carries a long tradition of fine craftsmanship as well. Their story begins in the 1600s, when poor farmers made additional income by creating woodcarvings from the readily abundant local trees. They carved elaborate clocks with moving figures, and as metal clockworks were expensive, they made these from wood, too. The region soon became known for its meticulously crafted and beautifully carved clocks, and their signature feature, whatever their size or complexity, was the little bird that popped out and said "cuckoo" on the hour. Among the most popular things to do in the Black Forest is visit a shop where they make the famous cuckoo clocks. Even if you don't plan to bring one home as a souvenir, it is fascinating to see the variety and complexity of these animated clocks, and watch as skilled craftsmen create them. You can see them being made in workshops at Hofgut Sternen in the Ravenna Gorge, in the village of Triberg, and at several other shops. Not far from Triberg, in Schonach, clockmaker Josef Dold created the World's Largest Cuckoo Clock, which was listed in the Guinness Book of World Records. Its face covers the front of a typical Black Forest house, and inside you can watch the operation of the giant works, which are all carved from wood. A shop in Triberg has since created an even larger one, but you shouldn't miss the opportunity to step inside a house that's a real cuckoo clock! 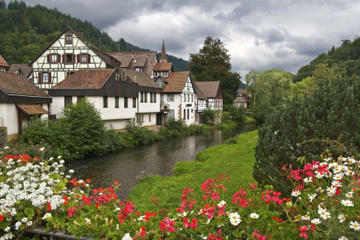 If you are staying in Frankfurt or Zurich, you can easily visit the Black Forest on an organized day tour. These tours focus on particular highlights of the region and include an expert guide and driver, saving you the time and stress of finding your way between the top sites. From Frankfurt: The 10-hour Black Forest and Strasbourg Day Trip from Frankfurt visits two beautiful countries in one day. Travel via air-conditioned coach to the famous spa town of Baden-Baden, at the edge of the Black Forest. Once you arrive, you can explore the top attractions on a guided walking tour and learn about the thermal baths. Then cross over the border to France to visit the Alsatian city of Strasbourg, with its UNESCO-listed old town and magnificent cathedral. The tour also includes a ride along the city's picturesque canals. On the 11-hour Black Forest and Baden-Baden Day Trip from Frankfurt, you'll visit all the same attractions in Baden-Baden before continuing on your comfortable air-conditioned coach for a scenic ride through the Black Forest to the lovely Mummelsee, a popular lake near Seebach. From Zurich: The seven-hour Black Forest and Rhine Falls Day Trip from Zurich includes regional culinary and cultural delights, as well as plenty of natural beauty. Hop aboard a luxury coach to visit the town of Titisee-Neustadt, in Germany's Black Forest. Here, you can see how cuckoo clocks are made and try some of the region's famous Black Forest cake. A boat ride on picturesque Lake Titisee is optional. On the return trip, you can admire the tumultuous Rhine Falls, thundering 23 meters into the river below, with plenty of free time for photos. Places to Visit near the Black Forest: Several exciting cities surround the Black Forest. The closest is Stuttgart with its excellent art and automobile museums. It's only a short trip to the north to visit the attractions of historic Heidelberg, and just on the other side of the Rhine River Valley from the spa town of Baden-Baden, you can visit the tourist attractions of Strasbourg, in France. Places to Visit in Switzerland: The southern Black Forest lies almost on the Swiss border. Our pages on the top-rated tourist attractions in Zürich and top-rated day trips from Zurich can help you navigate the city and discover more places to visit in Switzerland.